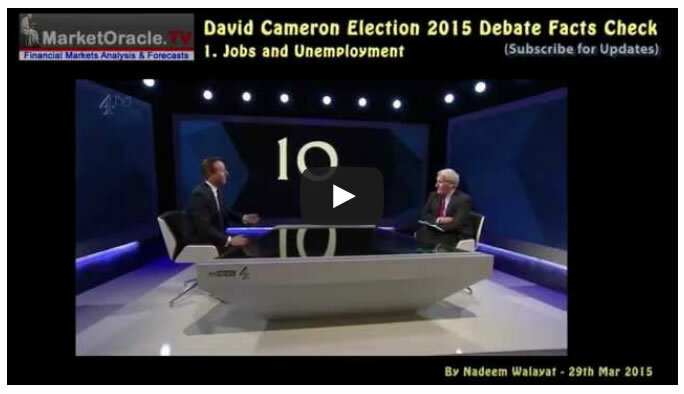 David Cameron having chickened out of a head to head debate with Ed Milliband left the Labour leader to on his own face the brought out of retirement Jeremy Paxman as the second debate of the night following his earlier 20 minute grilling of David Cameron. 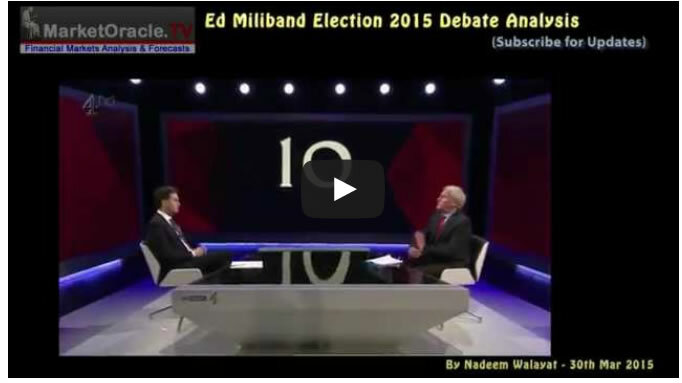 Jeremy Paxman started hard by focusing on the failures of the last Labour government in terms of immigration, debt, spending, economic collapse and the threat of a Labour-SNP alliance, but Jeremy relented towards the end of the debate to give Ed Milliband an markedly easier ride than the Prime Minister had received as the following comprehensive video of the debate and analysis illustrates. Ed Milliband admits that Labour got it badly wrong on immigration but promises that Labour will get it right next time but without any details of how, and in the end try's to change the question to one that he wants to answer rather than which was asked. The reason Labour supports unlimited immigration is because the vast majority of immigrants will tend to vote Labour. Therefore Labour sees immigration ultimately in terms of hundreds of thousands of new vested interest Labour voters imported each year that will ensure future election victories. As Jack Straws quote illustrates, Labour forecast 13,000 net immigration per year, whereas the actual number was in excess of 240,000 per year. Population growth is significantly running ahead of my forecast of 2010, that now implies UK population will reach at least 72 million by 2030. The assumptions being factored into the UK population growth forecast are for a natural UK population growth rate of births exceeding deaths of 0.33% per year (current 200k), coupled with net average current immigration trend of 240k per year, supplemented with climate change refugees averaging 50k per year from 2015 onwards extrapolates into the following trend forecast over the next 10 years that targets a rise from 62.2 million as of mid 2010 to 67 million by mid 2020, and should the same trend be maintained beyond 2020 then the UK population could rise to above 72 million by mid 2030. However in all probability the country will not experience the post 2020 trend due to several converging factors including political pressures, capacity constraints and the UK's relegation in the economic prosperity leagues. Which implies a tapering off of net immigration in favour of natural growth which implies a lower total of nearer 70.5 million by 2030 as illustrated by the below graph. The updated graph shows an actual trend trajectory as per the most recent ONS population data of into Mid 2013 of 64.1 million which suggests that the UK population could increase by an additional 2 million by 2030 as a consequence of what amounts to continuing out of control immigration and its birth rate consequences that translates into a population increase equivalent to 17 cities the size of Birmingham. The consequences of out of control immigration can be seen in the impact on public services such as schools, NHS and on housing, as since 2000 the annual increase in population started to far exceed the number of new builds that ended the preceding trend for construction to exceed population growth in terms of addressing the UK's chronic long standing housing shortage which implies over the Labour years demand for an extra 1.25 million properties had been built up that is driving house prices ever higher. The below graph further illustrates the ratio between the accumulative change in population since 1970 against the accumulative number of new housing builds also since 1970 as a ratio that shows the level of accelerating UK over crowding and why house prices will continue to rise. This illustrates the change in trend that started to take place during the mid 1980's that coincided with the Thatcher governments reversal of the policy for the construction of social housing and implementation of the right to buy programme that resulted in the sale of millions of socially owned local council housing that ignited the property boom of the nineties AND noughties, the trend that was set in motion was for the inability of supply to keep pace with population growth which ensured continuously persistent upward pressure on house prices that despite the great recession still showed an accelerating trend as new build supply that currently stands at an estimated 140k per year is set against government estimates for a requirement of at least 250k per year, with 300k a more realistic estimate when the trend for a falling household size is taken into account, which thus ensures that the UK's over crowding situation is expected to continue to worsen year on year going forward, especially if the size of average households continues to shrink which would require 70,000 new builds per year even if the population stopped increasing. And this analysis does not even consider the fact that each year the total number of properties remaining empty continues to rise either as a consequence of being for sale, let, legal issues or falling derelict. This totals now more than 1 million empty properties at any one time, a number which despite demand looks set to continue to rise as many of the derelict buildings will only come back on the market when they have been demolished and rebuilt, so erroneously counted as new builds when they should be classed as rebuilds. Ed Milliband admits that the last Labour Government overspent, but blames the financial crisis for the borrowing, and repeatedly tries to avoid answering the question by making up his own. However, the reality is that spending under the last labour government was literally out of control, running a budget deficit of £170 billion in its last year that literally threatened national bankruptcy as the climax of a decade long accelerating debt fuelled spending binge as Labour sought to reward its vested interests in the public sector voters with huge expansions in budgets including the tripling of many spending departments such as the NHS. 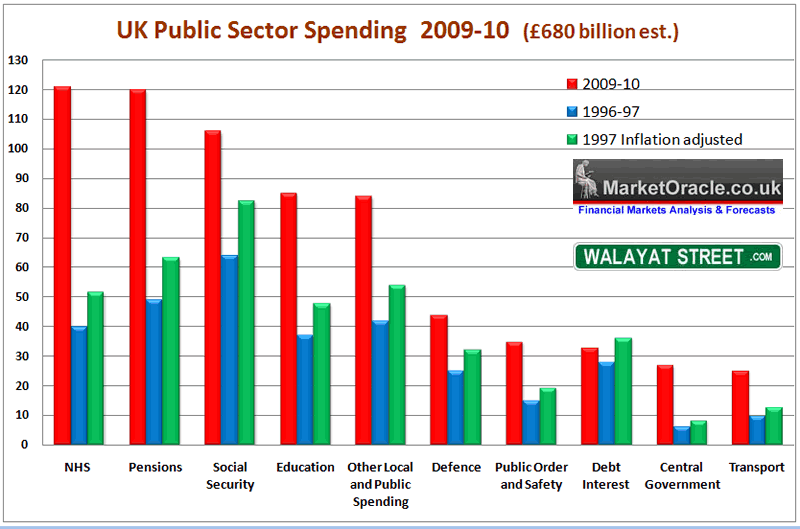 To imagine that a Labour government would cut public spending is delusional because it is not in labours DNA to cut public spending as the last labour government illustrates when the budget deficit was literally out of control and debt and liabilities were multiplying, increasing from £1.4 trillion in 2005 to £4 trillion by May 2010. Labour had literally brought Britain to the brink of financial collapse. 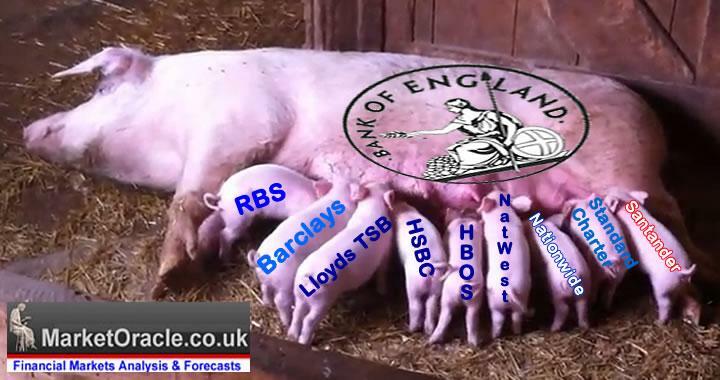 that proceeded to stuff every orifice of Britains bankrupt banks with tax payer bail out cash and guarantees and to monetize government debt. 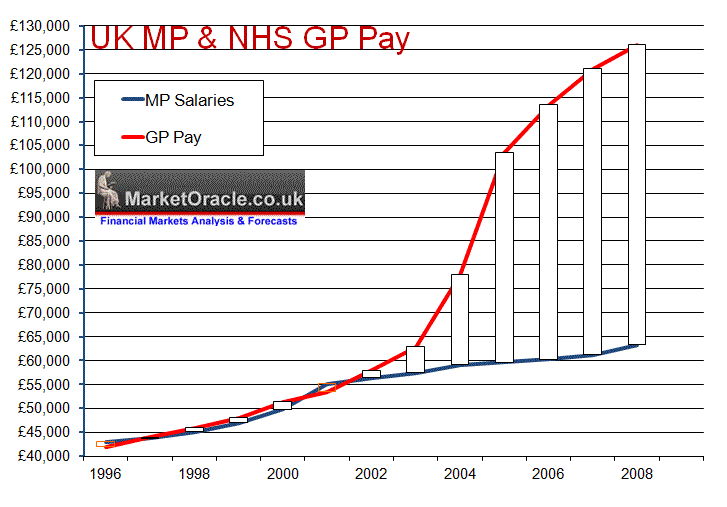 The risk is of a repeat of Labour's economic collapse.